The Sunday of Labor Day weekend, after working the brunch shift at work, I came home, showered and trekked to NoDa. I had RSVP’d to As You Do II Vegan Pop-Up a while back after my friend Cece had told me how great it was. Naturally I immediately bought a ticket as soon as I heard they had announced a date. 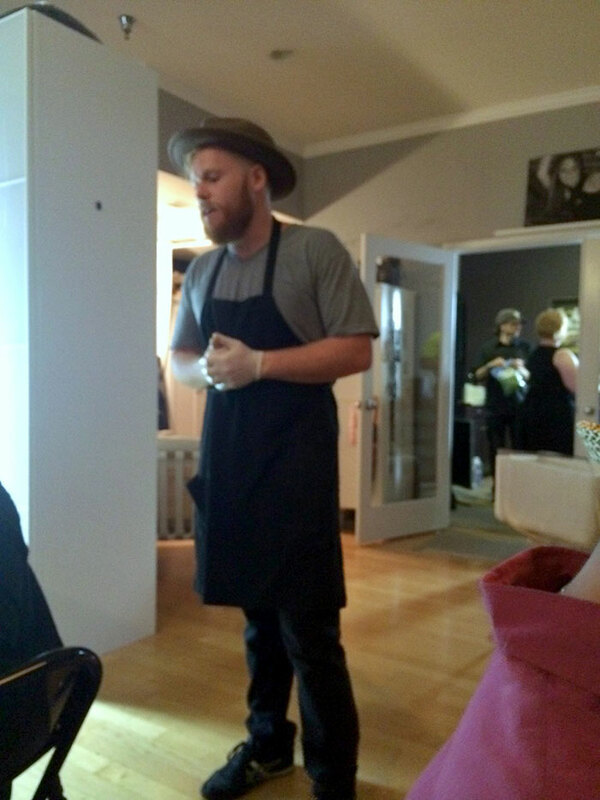 The pop up dinner was held at Chef Shawn Harrison’s parents’ business, Photographic Elegance, Inc. I skillfully found a parking spot on North Davidson Street, which is always the most delightful of tasks and walked up to the door of the building. To get in, you rang a doorbell and someone would come and open the door for you. Fancy. I walked into the most intimate room. I must admit, it was not what I was expecting, but I loved the vibe. 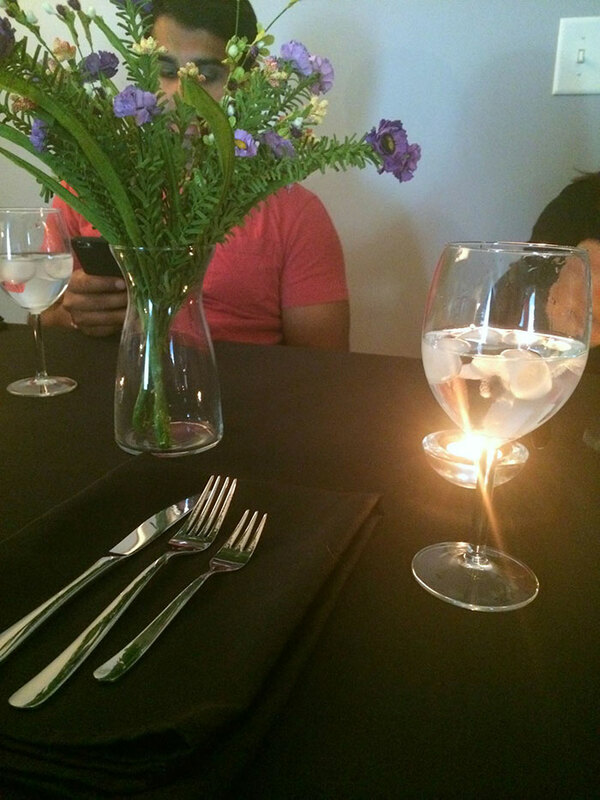 I sat down at a black linen lined table with three people I’ve never met before. Sounds daunting, but it was quite enjoyable to talk and joke around with three strangers, getting to know a little bit about each other, one dish at a time. Our night started out with Brian Williams, better known as “Chef Cat” greeting our small group of about 12 people. He’s super charismatic and exudes passion about what he does. Passion like that is invigorating, contagious if you will. I couldn’t wait to eat everything he had just described. Wine was poured and out came a little appertif to start our palates off. 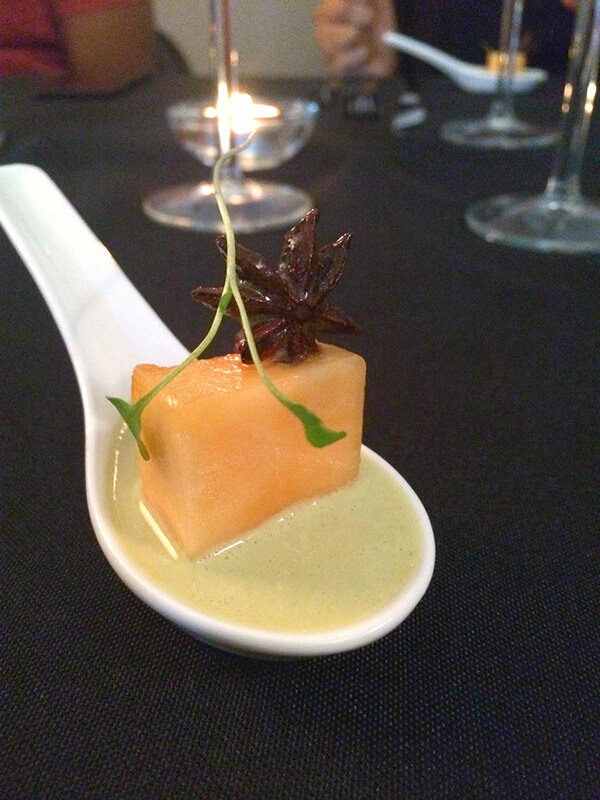 Cantaloupe Cube: Curried Bell’s Best Berries Papalo Puree. Lemongrass Candied Star Anise. Wow, was this a spoonful of flavor to the face. The curry was definitely noticeable, but not too overpowering. It went perfectly with the sweetness of the cantaloupe. Oh, and can we just talk about that candied star anise?! It wasn’t edible, just meant to be kind of savored in the mouth for flavor. At this point, I was excited. Game on. Our next course kicked things into high gear, literally. Pickled Coto Family Farms Ali Baba Watermelon Rind. Compressed Watermelon. Jalapeno Mint Juice. Tellicherry Peppercorn Candied Orange. Tega Hills Arugula Micros. This salad was so light yet full of flavor. By compressing the watermelon, the flavor was so enhanced. It was all about the sweet and spicy in this dish. The jalapeno juice definitely packed a punch and the peppery arugula was a great match to all of the flavors dancing around on the plate. 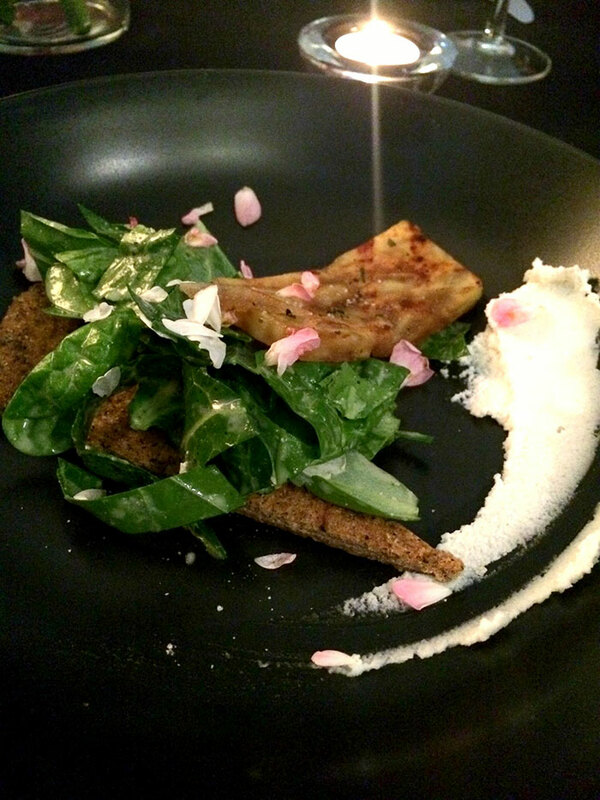 The third course sounded so tantalizing as soon as it was described to us, that I could not wait to taste it. The aroma of this specific course being prepared didn’t help either. Whisky Maple Glazed Sweet Potato Plank. Bitter Herb Salat. Rosemary Smoked Macadamia Yogurt. Wild Flowers. Ash Flat Bread. This was a close second to my favorite dish of the night. The sweet potato was actually a Korean white yam, which added a unique flavor to this dish. The bitter greens in the salad were fresh collards. They combated the sweetness very well. Now let’s have some real talk, and let me tell you why this was one of my favorite dishes. THAT YOGURT. Holy delicious. Everyone of us at my table just about licked the plate because of it. I’ve never tasted anything like it. I told Chef Cat that he needed to sell that and he laughed and told me it was too expensive. But seriously I don’t care how much it is, I’d buy it. 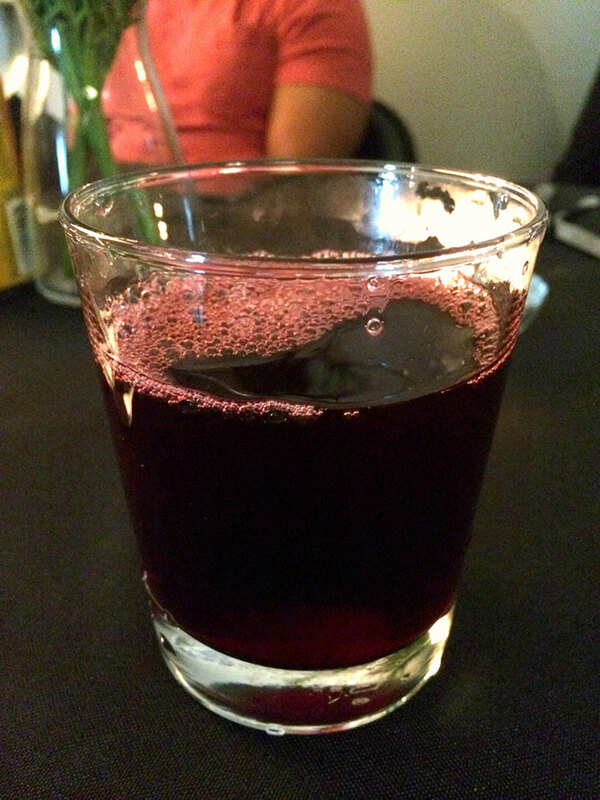 After that dish, we were given a glass of hibiscus ginger water. I wasn’t sure if I’d like this, but it, like everything else, surprised me! It was great! A little tart, a little sweet and the ginger had a nice, subtle spiciness to it that kept me coming back for more. As I was sipping on my hibiscus ginger water, I thought to myself that I wasn’t sure anything would beat that previous dish. I mean, even as the fourth course was being walked to my table, I was still thinking about that dang yogurt. I was wrong. 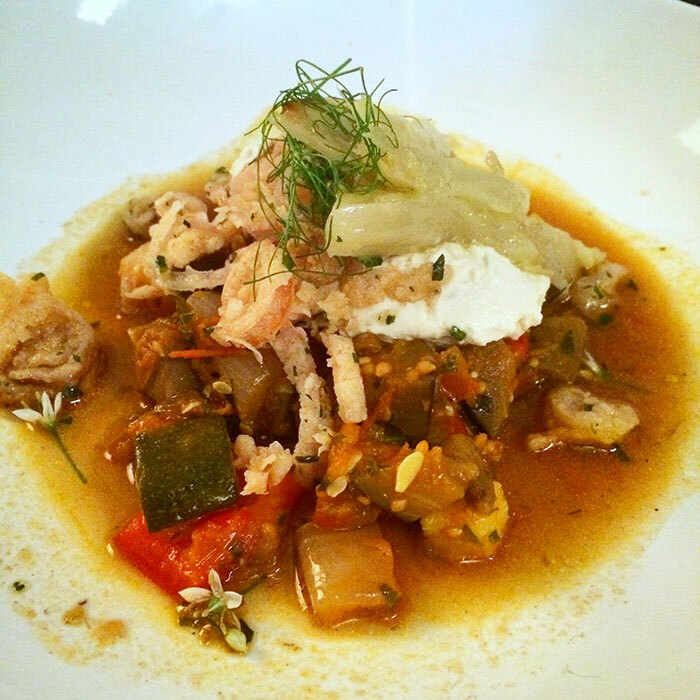 Overnight Coto Family Farms Heirloom Tomato Ratatouille. Caramelized Fennel. Charred Sweet Onion Jus. Tree Nut Ricotta. Tarragon Crispy Fried Shallots. Lemon Oil. So, so wrong. In fact, this ended up being my hands down, favorite dish of the night. How’d that happen?! This was just my kind of food. It was jam packed full of flavor, yet so comforting. I may be biased due to the fact that I was already a huge fan of ratatouille, but this may have been one of the best I’ve ever had. That jus was so delicious, I wish I would have had some bread to sop it all up with. Also the cheese that wasn’t really cheese was, dare I say, almost better than fresh ricotta cheese? So good. I’ll be spending my days and night trying to figure out how to make tree nut cheese now. At this point, I probably could have stopped here and been happy. Then I looked to my left to the kitchen and saw the desserts being plated, and suddenly I wasn’t so full after all. Champagne Nectarine Panna Cotta. Cinnamon Orange Candy. Raspberry Port Ice Cream. Blackberry Coulis. Toasted Almond ‘Crumble’. Well this was a delightful finish to the evening. 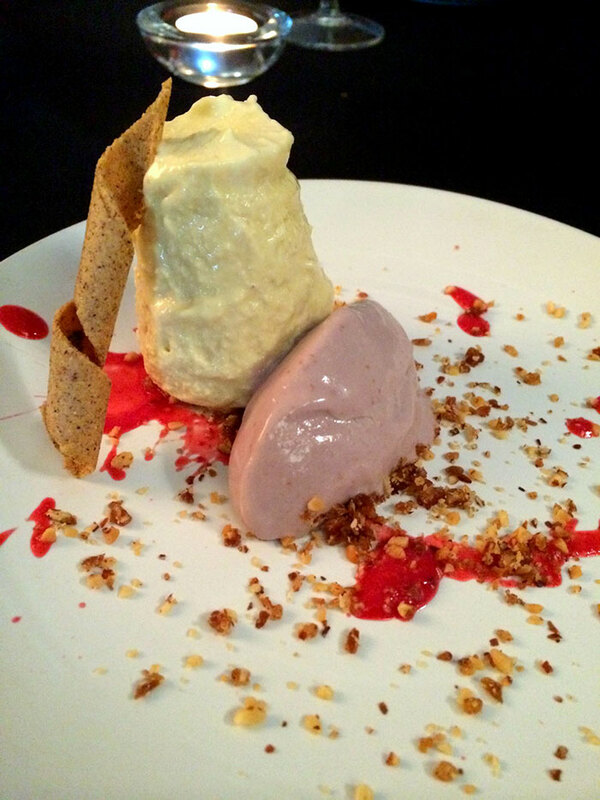 I was instantly amazed at how the chefs managed to make a panna cotta and ice cream that darn good and keep it completely vegan. Chef Cat came over and told us a bit of his process about the ice cream and I was amazed. I never would have thought of this. Geniuses. All of them. I am inclined to tell you that I am not a vegan. 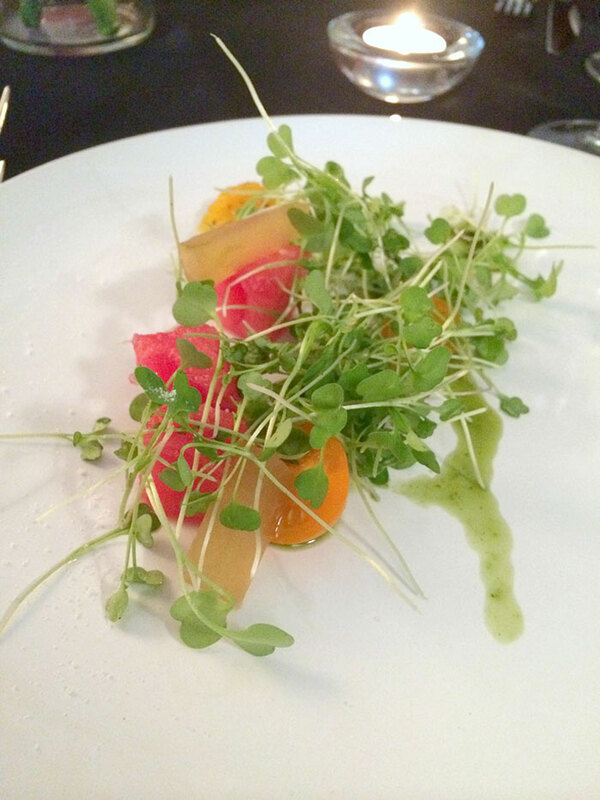 Even though I do not follow a strictly plant based diet, I thoroughly enjoyed this dining experience. The thought and passion that went into these courses were beyond anything I could have ever imagined. As Chef Cat said, “You can really do a lot with plants.” I can honestly say I did not miss the meat at all and was actually quite full. 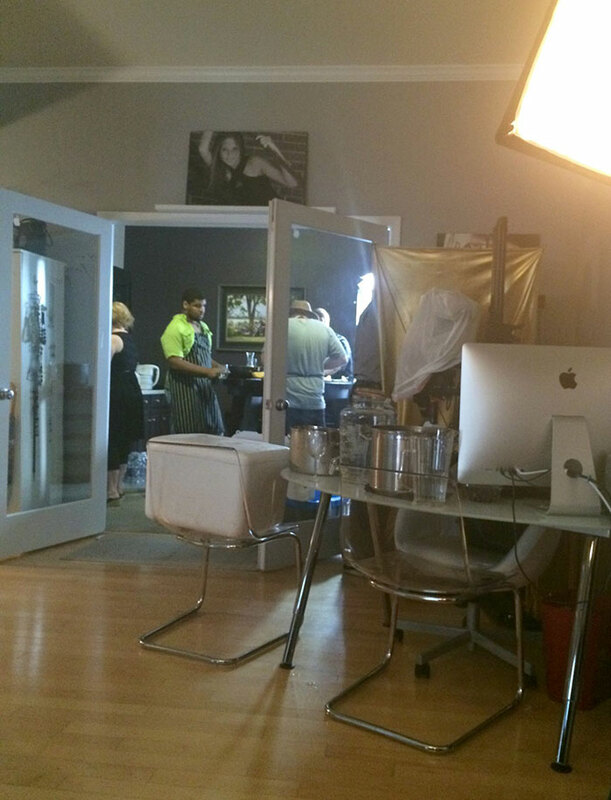 Chef Shawn and Chef Cat are without a doubt transforming people’s perception of vegan food. It doesn’t have to be boring. It doesn’t have to be just a salad. The possibilities are endless. The world is your oyster. I really think that they can fill a void in Charlotte with this type of progressive, plant based dining experience. I’m looking forward to seeing what else these guys have up their sleeves. Be on the lookout Charlotte, they’re coming for you. What’s next for Chef Cat: He will be putting on a raw dinner with his brand, Terra Flora next month. Details: TBD. 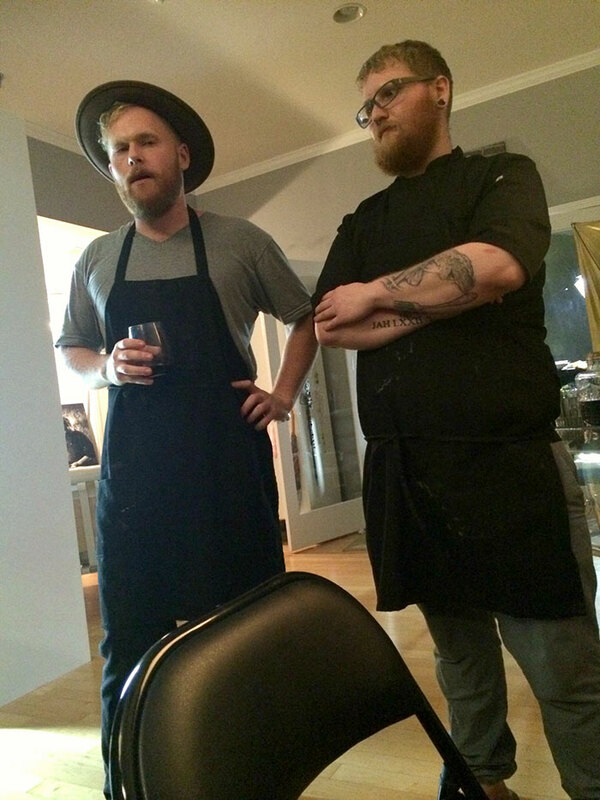 What’s next for Chef Shawn: He is the VIP chef of DamFest 2015. 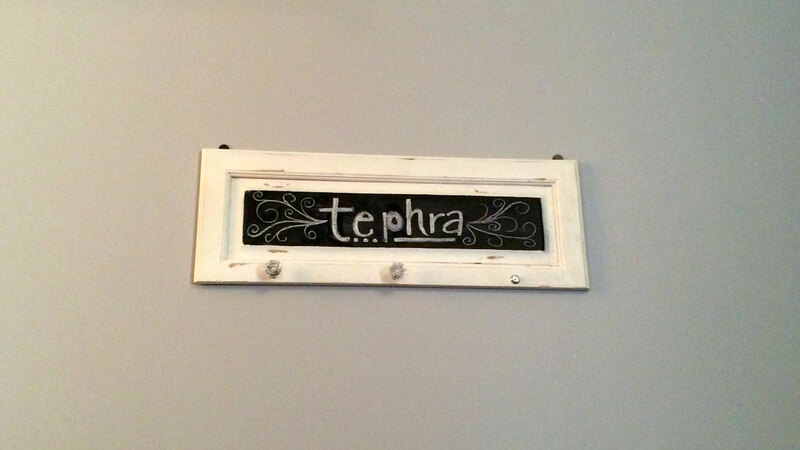 Be on the lookout for his work with Tephra as well.